Aarhus Municipality creates synergy between nature and climate adaptation in the swamp Geding-Kasted Mose. Northwest of Aarhus, the municipality has taken a holistic approach combining climate adaptation and biodiversity into a large natural area. 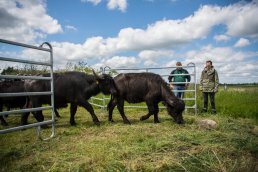 Under the name Rewilding Geding Kasted Mose, the municipality seeks to promote more dynamic wildlife by introducing pastures for natural cattle, wild horses and water buffalo, in order to make the area self-regulating. The rewilding concept is about creating year-round pasture and giving animals and water more space in the landscape. The latter occurs by opening drainage and un- restraining streams and wetlands, which are also well-known climate adaptation methods that reduce flood risk in nearby urban areas. The methods include reduced drainage of organic soils which has the added benefit of increasing soil carbon levels. Reintroducing pasture animals mirrors ancient ecosystems before mass human intervention, protecting the area’s many rare species from disappearing. Aarhus has added a further 36.5 hectares of former farmland to the natural area. This shift from intensive farming to conservation generates a significant annual saving of greenhouse gas emissions. Moreover, groundwater is protected in this additional area. The municipality’s goal is to establish a 140-hectare cohesive conservation area which contributes to climate protection, increases biodiversity and creates better experiences in nature, improving quality of life for citizens. The area has become a green public getaway with 5.9 kilometers of new trails encouraging visitors to reconnect with nature and exercise, thus improving mental health and well-being. Vulnerable groundwater is protected by converting 36.5 hectares from farmland into a natural area. The groundwater provides approximately three million m3 drinking water for citizens every year. Ecosystems are protected by reintroducing ecosystem-regulating species which help increase biodiversity and reduce the need for supplementary inputs year-round. Aarhus Municipality is Denmark's second largest municipality with more than 335,000 inhabitants.